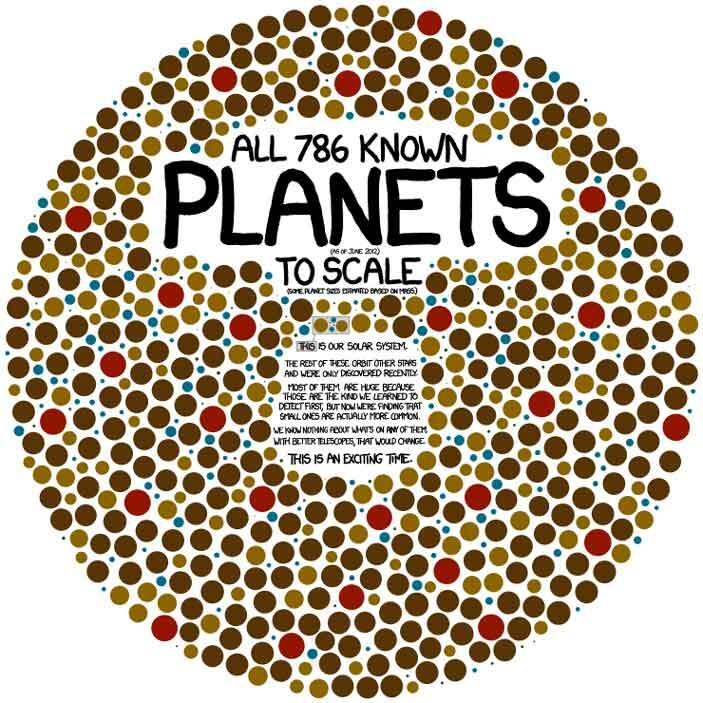 All 786 known planets, to scale. “This” (tiny gray box) is our solar system. The rest of these orbit other stars and were only discovered recently. Most of them are huge because these are the kind we learned to detect first, but now we’re finding that small ones are actually more common. We know nothing about what’s on any of them. With better telescopes that would change. Find the original graphic on XKCD. Saturday’s launch of a piloted space capsule known as Shenzhou-9 marks China’s breakthrough into the exclusive club once made up only of the United States and Russia. One of the three astronauts in the capsule is a woman, 33-year-old Liu Yang, the first Chinese woman in space. Shenzhou-9 was launched at 6:37 p.m (local time) against a vivid blue sky from the Jiuquan space station at the edge of the Gobi Desert. Televised nationally, the launch prompted a round of applause in the command center as the capsule separated from its carrier rocket and entered orbit. The trickiest part of the mission will come when the capsule docks with the Tiangong 1 space module, a prototype of a space station about the size of a school bus, which is orbiting about 213 miles above Earth. Biggest full moon of the year – this Saturday night! The largest full moon of 2012 happens this Saturday, but it’s OK if you don’t really notice. The moon doesn’t really get bigger, it just gets closer to Earth. At 8:40 p.m. Pacific Time on Saturday, according to the Griffith Observatory Sky Report, the moon will be at its closest point in its orbit to the Earth this year. (Accounting for the time zone difference, European moon-watchers will see it Sunday.) To be precise, Earth and moon will be just 221,801 miles apart — more than 17,000 miles closer than average. Posted on May 4, 2012 Author robotchampionCategories defaultTags astronomy, bigger, brighter, closer, earth, full, lunacy, lunar, moon, NASA, orbit, Science, sky, space, stars, wackyLeave a comment on Biggest full moon of the year – this Saturday night!